Karen's newest book, published by the American Quilter's Society. Famous for her use of color and color illusion, the author shows how to use color, texture, and value to add excitement to Celtic quilts. She shares her simple design concepts for those who want to design their own Celtic quilts, while providing piecing tips, pressing options, and quilting ideas. Even beginning quilt makers can tackle these colorful quilt patterns. Teaching tips and lesson plans are included for quilt teachers and shop owners. $25.00 To order, click here. 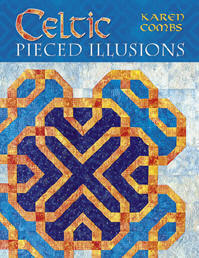 Click here to see what others are saying about Celtic Pieced Illusions! A quick rotary cutting technique as well as traditional piecing.